True Love comes with no ties or expectations, and offers no pain. It is given freely and without any trade, or need to control. 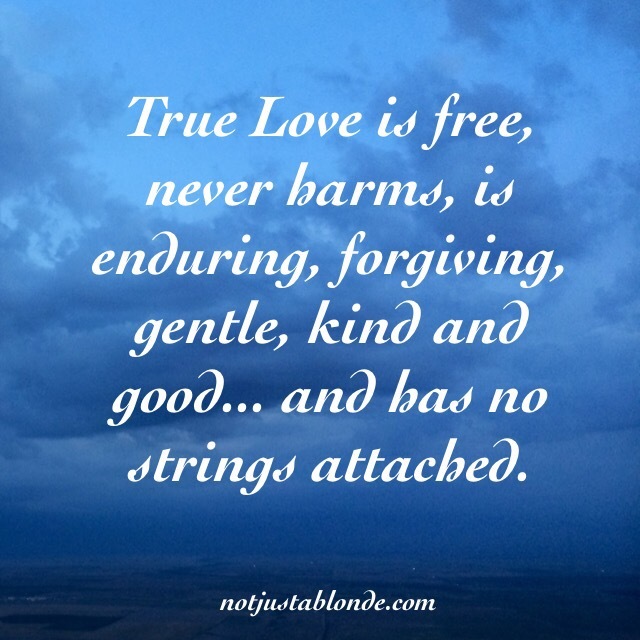 True Love never harms, is enduring, forgiving, gentle, kind and good… and has no strings attached. With True Love you release the need to “get” and are focused on how best to “give”. True love never demands the sacrifice of the true self, and acknowledges the divinity within both the giver and the receiver. True love offers the humble awareness that in Creation there is no one more lovable to God than another. Hi Blonde, can you share with me what graphic-creation program you use? If you would rather respond by email, it is tchastain@cfl.rr.com.